What Does Malware Do To Your Computer? Most people have reputable antivirus software installed on their computers. This is a great thing! Many of the antivirus programs around today protect computers against all known types of malware threats. This, too, is a great thing! 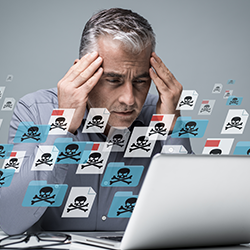 The word malware is the quick substitute word for the term "malicious software." It refers to any virus, worm, adware, Trojan, spyware, etc., that can get into your computer. Some years ago, the only kind of malware we had to deal with were computer viruses. Malware has the capability to corrupt files and steal private information like credit card details and send them back to the hacker. Some malware programs were simply written to annoy computer users. A computer-savvy user may write such a malicious script to entertain himself. On the other hand, the purpose of malware may be to destroy your computer making it completely inoperable! Even worse the goal of malware might be to shut down a large network of computers. This would usually be referred to as cyber-terrorism. Trojans are a type of malware variants that look legitimate. A trojan can not only steal your sensitive data, but they can also give cybercriminals access to your computer, financial and personal information. The hacker who creates a Trojan can access your private information using the Trojan installed on your computer. That private information could be your passwords, banking account numbers, credit card numbers, etc. Malware variants such as viruses and spyware can slow down your computer as they are capable of accessing your computer's resources at any time. Unlike typical computer programs, viruses and spyware do not have kill option. In other terms, you don't have an option to shut them down. Malware as worms can replicate themselves and infect multiple computers on a network causing major damage. In contrast, viruses require the spreading of the infected host file or program. Worms are standalone software and do not need a host file or human help to spread. Malware variants like adware can bombard your computer screen with frequent popups. Unlike viruses or spyware, adware doesn't steal your personal information rather they will show popup advertisements. At times popups may fill up your entire screen, and you cannot close them since they do not come with a kill/close option. The best way to prevent malware is to install a good antivirus program like Comodo Antivirus. In an organization, it is not as easy to prevent malware with antivirus software. Endpoints are the easiest targets for malware infections as most of the devices have outdated software or operating systems. To protect all of your endpoints, you need advanced endpoint protection solution. Comodo Advanced Endpoint Protection (AEP) is such a solution which has stopped over 85 Million Endpoints from being infected.